For the hubster and the Mother in Law’s Birthdays, we were invited to celebrate at the NEW Lucille’s Smokehouse Barbeque in Santa Ana. This brand new location is in a prime spot at the Santa Ana Main Place Mall. 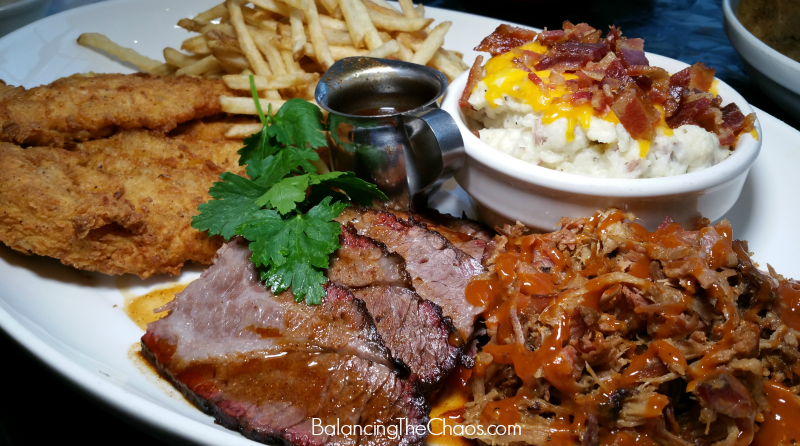 Lucille’s offers delicious home-style smoked and barbeque dishes to fill a hearty appetite. 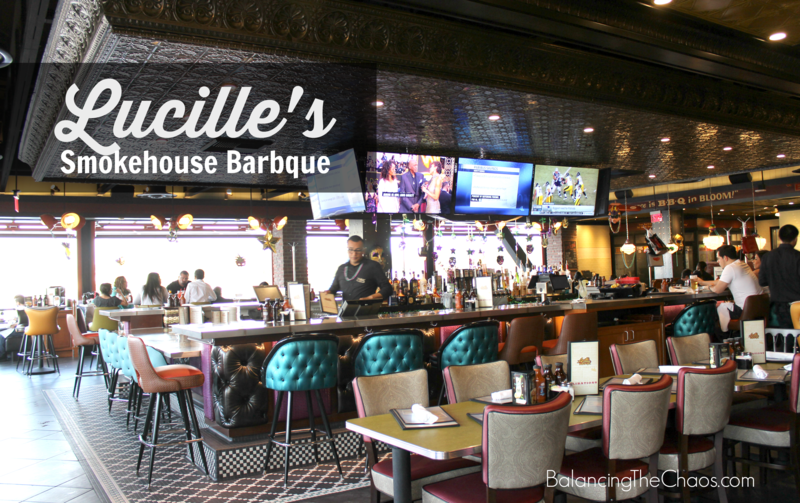 The new Lucille’s location in Santa Ana is beautifully decorated with a rich color palate, large comfy bar stools and thick cushion seating all throughout. I noticed that they had larger tables than typical restaurants, allowing them to quickly seat larger parties of 6 or more. Flat panel televisions were scattered throughout so you can catch the local sporting event anywhere in the restaurant. The staff was warm and friendly, several dropping by to check on us to make sure we were completely satisified with our experience. We decided to start off the celebration with a few appetizers. We HAD to try the Southern Fried Dill Pickles. 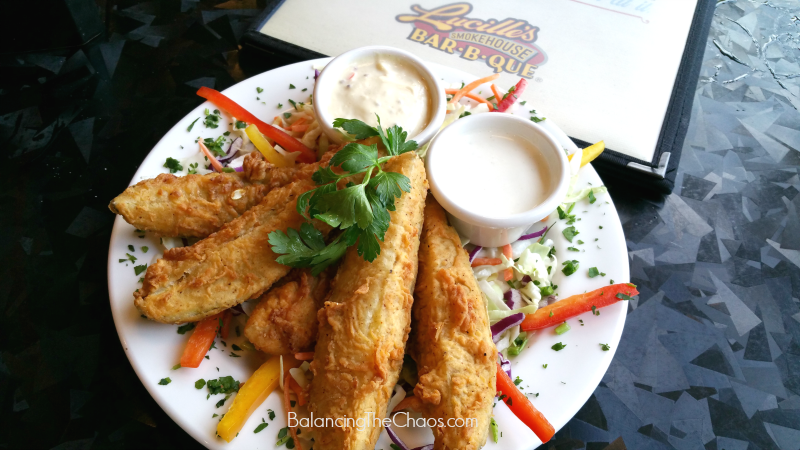 Large dill pickle wedges that are sliced and breaded in a spicy flour and fried crispy; served with Creole mustard dipping sauce and ranch dressing. As soon as they arrived at the table, we all jumped right in for a bite – however it was HOT! Warning, these babies come right out of the fryer so be super careful! But, once they cool down a bit – absolute deliciousness! I had to try Lucille’s Onion Straws. 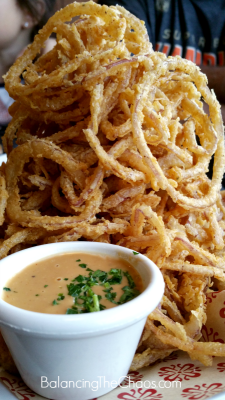 A delicious mountain of irresistible buttermilk battered onions, seasoned and deep-fried and served with their very own BBQ ranch dipping sauce. One thing about Lucille’s that Nick, the manager we spoke with is that all of Lucille’s sauces and dressings are created from scratch right in their kitchen. Each one I tried, from the dipping sauce with the onions to the homemade ranch dressing – all were absolutely delicious and left me wanting more. For my handsome boy, we ordered Lucille’s Grandma’s Noodles and Macaroni and Cheese since they BOTH wanted to load up on pasta. Amazingly, my picky eaters devoured their noodles in a flash. My darling daughter decided she wanted to attempt something different for a change. She picked the Finger Lickin B.B.Q Ribs. Just her size, they served her a quarter rack of baby back ribs with a side of fresh carrots and homemade ranch dressing, which was as good as it was messy! Grammie decided to order the Lucille’s Baby Back Ribs where they choose the tenderest, meatiest little pork ribs and slow-cook them with sweet hickory smoke, then grill and baste them with their special BBQ sauce. The hubster decided on the Two Meat plate with pulled pork and brisket. He also chose to have the fried chicken rather than the barbeque chicken based on Nick’s recommendation. 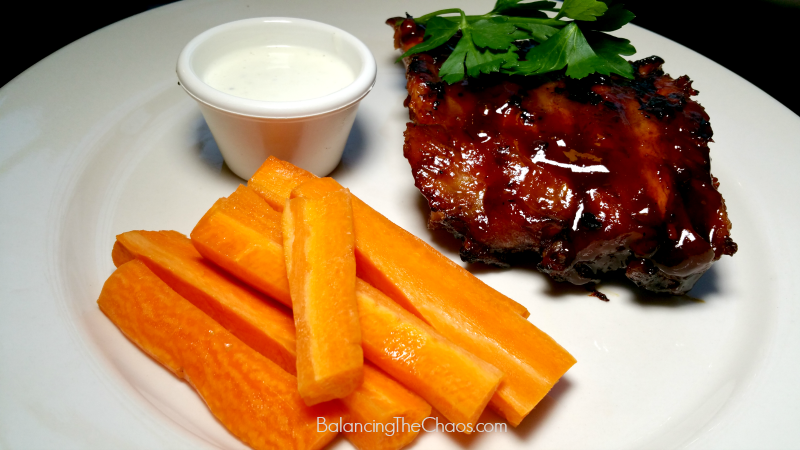 Then he paired that with loaded garlic mashed potatoes and fries (for the kids). This plate was enough to serve two it was so big! 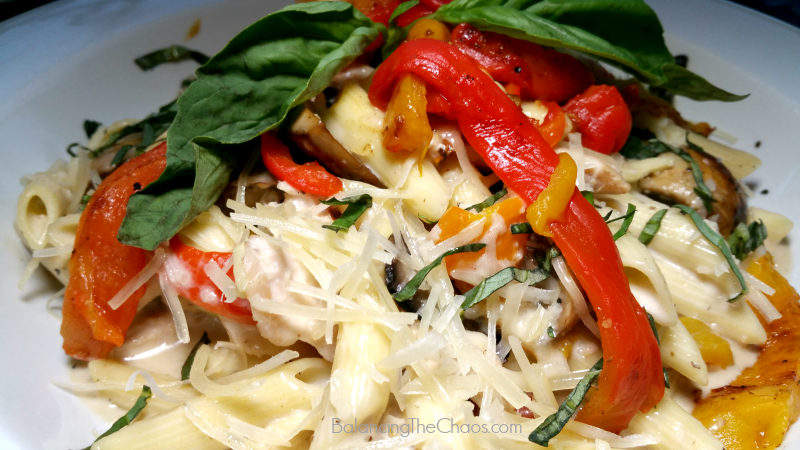 Then I selected the Smoked Chicken Pasta with Portobello and button mushroom, smoked pepper all tossed in a creamy garlic parmesan sauce over penne pasta. 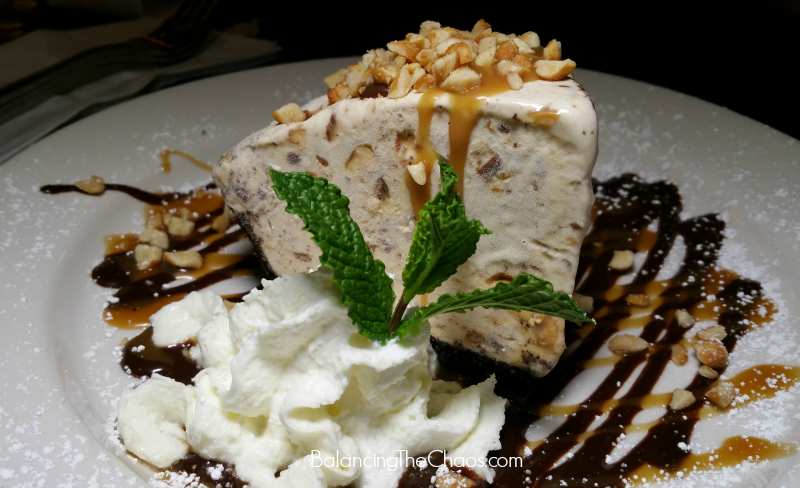 To finish off the evening, we selected the decadent Snickers Ice Cream Pie. Oh my goodness, this was simply heaven for me. Made in their own kitchen, the staff at Lucille’s hand mix ice cream and chunks of snickers into a pie with an Oreo cookie crust. They solidify it in the freezer for a few hours and out comes this BEAUTIFUL, mouth watering pie. It’s a MUST order! Plan your next meal at Lucille’s Smokehouse Barbeque in Santa Ana – they’re sure to dish out an amazing night of food and fun! Ask for Nick and tell him I sent you. If you frequent Lucille’s, you have to share your favorite dish! I know we’ll be back, and are looking to try something new each visit!